During this time of year, my clients and I are always in awe of the wildlife activity that goes on in the inland waters. Dolphins, sea turtles, man o’ war birds, ospreys, pelicans, manatees, sheets of thread fin and Spanish sardines, pods of greenbacks, schools of mullet, ladyfish, jacks, bluefish, Spanish mackerel, kings, bonita, tarpon, snook, trout, reds, cobia, grouper, snapper, sheepshead, flounder, triple tail, black drum, and shark. Most of these fish have eggs in them, with the exception of sharks who have pups rather than eggs. They are here for two reasons, to spawn and to feed. The feeding is ravenous. I clean many of these fish for my clients’ table fare and most fish have big bellies, due to egg sacks and a bunch of bait fish. *For inshore kings, Spanish mackerel, bonita, ladyfish, jacks, bluefish, and sharks look for the birds, especially the man o’ war birds. Find sheets of schooling bait fish. Increase your line and leader strength by 20%, because this time of year you never know what might bite your bait. For example, many times we’re out mackerel fishing with #3 long shank Mustad hooks and 50 lb Ande mono leader and a big king, cobia, tarpon, or shark jumps on the line. Many anglers have a tendency to either use a lighter mono leader to get more strikes in clear water, or use a wire leader to lose less fish. Both are great ideas, however 50lb leader seems to be the best all around versatile leader for most occasions. *Reds, snook, and trout can be found outside on the grass flats or in the mangrove estuaries. Look for points with moving water, exposed oyster bars, and deep sand holes. When live bait fishing, chum a lot. These spawning game fish are like puppies, it’s hard to over feed them. Chumming makes hungry fish hungrier and makes them appear on the surface so you can locate them and keep them there and feeding. Reds and trout can be harvested all year long. *Look for tarpon under bridges, deep passes, and shallow sand flats. If you see pass crabs flowing into inland waters, use pass crabs, or thread fins schooling nearby use thread fins. Capt. Page taught me years ago how important it is to match the hatch when tarpon fishing. He and I ended fishing the same pod of tarpon one morning in a cove north of Port Manatee filled with huge feeding tarpon. He sees me casting hand sized thread fins at these tarpon, he yells over to me “use a little pinky thread fins, that’s what they were feeding on, remember elephants eat peanuts. *Cobia and triple tail are showing up daisy chaining around manatees, sharks, manta rays, markers, cans, bridge structures, and towers. Many times in May, you’ll see two cobia together. One will be long and fat (female) the other will be short and skinny(male). 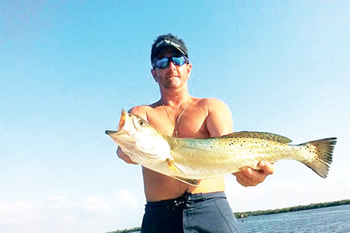 If you are sight casting at the cobia, many times the male will get to the bait first. You can either pull the bait away from the male allowing the female to eat your bait or hook the male and leave him hooked beside the boat for an extra minute and have a second angler cast at the female. *Grouper, snapper, black drum, sharks, and sheepshead can be found in depths of between 25 and 45 feet of water near shipping channels, bridges, and inlets.